Above is a screen dump of the options added by the appended file. Here is the modified boards.txt in boards.zip for Arduino 1.6.12. 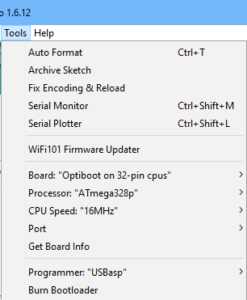 Arduino 1.6.12 seems to use the boards.txt located at %LOCALAPPDATA%\Arduino15\packages\arduino\hardware\avr\1.6.15 in my Win10 installation… but it could be in difference locations in different Arduino and Windows versions. Find it and replace it with the one in the zip to added the full Optiboot options. Note this will probably be overwritten by version updates of either Arduino IDE or perhaps even just the board manager. Arduino has not come to a good solution for user extension to boards.txt… not yet anyway. Here is a bat script that I use to perform the work, it needs to be rerun after board manager has been run, it might be the basis for your own work. rem sed -nf AddBoards.sed <"%BOARDSDIR%boards.txt" >"%BOARDSDIR%boards.bak"
sed -bne "/#DO NOT MODIFY BELOW/q;p" <"%BOARDSDIR%boards.txt" >"%BOARDSDIR%boards.bak"
rem copy /b /y "%BOARDSDIR%boards.txt" "%BOARDSDIR%boards.bak"
copy /y /b "%BOARDSDIR%boards.bak" + %workfile% + optiboot\boards-1.6.txt "%BOARDSDIR%boards.txt"
Note the location of the Optiboot boards file. Arduino IDE is not very stable so path names may change rendering the script ineffective. One day, Arduino IDE might contain a feature for painless user extension of the boards file. Both or these scripts assume they are run from the Optiboot distribution directory (cloned from the repo).